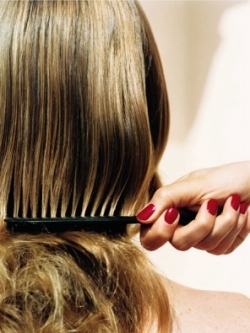 Hair thinning is one of the basic problems that affect our strands. Indeed natural hair thickening remedies can start a real battle against various disorders. These organic methods will be eager to restore the health and shiny condition of your locks. Rely on their power to polish your appearance and improve your health condition. Include these rituals in your beauty care routine for the desired and smashing effect. Our hair might suffer due to the effect of pollution, health problems as well as damages caused by inappropriate hair care. There are several treatments both medical and natural that can reduce the measure of deterioration. Consequently it's important to furnish our hair follicles with the best nutrients and vitamins to establish the proper conditions for a healthy hair growth. Besides appealing to these tricks it is also important to adopt a balance diet rich in all the important supplements, essential both for our development as well as the spotless state of our hair, nails and skin. These green hair thickening remedies will cure problems right from the roots and would eliminate all the harmful factors that might threaten our health. Raid the local store for the basic ingredients and prepare the following hair spa solutions. Eggs: It's not a new information that eggs are rich in all the basic nutrients that are important for our organism. Hair requires an increased intake of vitamin A,D and also vitamin B in order to grow properly and maintain its best shape. Moreover hair loss and deterioration can be the direct result of the inappropriate condition of the scalp. A similar quick treatment will control the sebum production in the head and would allow the elimination of all toxins. All you have to do is beat an egg into a bowl and massage it into your scalp. Make sure it covers all the strands, leave it to exercise its effect for 5-10 minutes then rinse it off with cool water. This ritual will strengthen the protein layer on your strands which will visible thicken your locks. Honey: Honey is a common element used in beauty care due to its rich composition in vitamins and nutrients. Therefore use it to handle worn-out strands and thicken hair. Moreover appealing to a similar trick would also leave you with shiny and voluminous locks. Though it might require some mastery to perfect the art of a similar treatment it is worth trying it. Cover your strands with honey make sure you tackle both the scalp and the tips. Cover the head with an old towel and leave it on for at least 20-25 minutes. Wash off the lotion with warm water and cleanse it with your normal shampoo and conditioner. Avocado and Banana: These two fruits offer the proper treatment for broke down locks. Due to their content of Vitamin A, B and E as well as potassium this smashing combo will balance the moisture production and will also increase the resistance of the strands towards excessive heat, and damage in general. This will contribute to the quick and most importantly healthy growth of your strands. In order to prepare this nourishing paste mash 1/4 avocado and the same amount of banana into a bowl. After you prepared the paste, massage it into your locks and scalp. Use an old towel or a shower cap to cover your hair for at least 20-25 minutes. Boost hair strengthening and thickening with a similar treatment. Oat Flour: One of the top notch elements that can be used to naturally thicken hair are lipids. These ingredients can be found in normal oat flour, you'll be able to purchase from any grocery shop. Moreover you can also complete your diet with this healthy nutrient since it does miracles not only with your hair but also skin. Combat hair loss and skin problems with a similar treatment. Take your normal conditioner and add 2 tbs. of this ingredient to the lotion. Make sure you use this product every time your wash your strands. Rinse the magical composition off with lukewarm water.